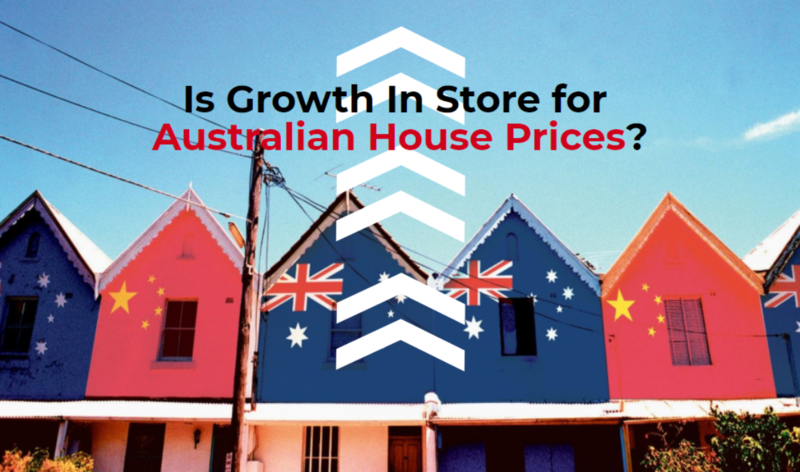 Is Growth in Store for Australian House Prices? 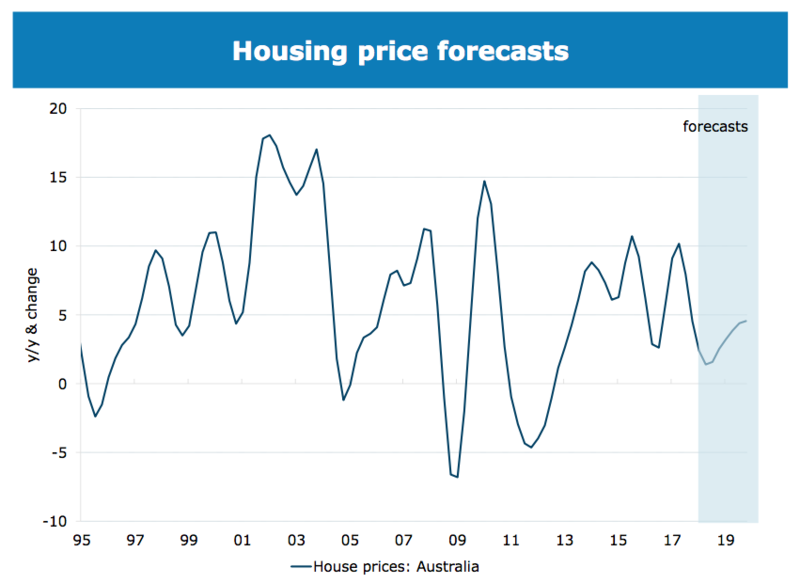 What’s in store for the Australian housing market in terms of price growth? 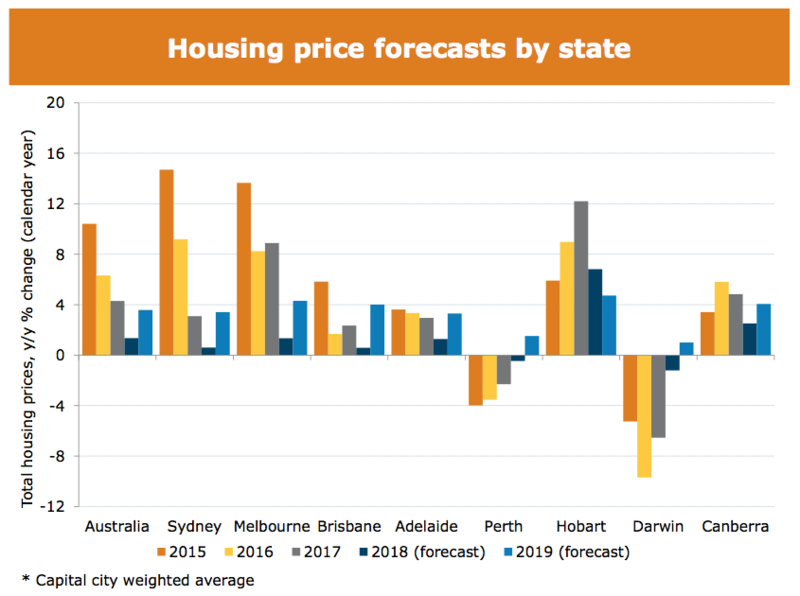 This year will not be a bumper one for the Australian housing market; Sydney will drag Australia house prices down this year. But will it be all doom and gloom moving forward? What does the future hold? Australia and New Zealand Banking Group (ANZ) economists say Australian house prices will start to go up this year, with higher growth expected in 2019. Australian house prices are 0.8% higher than they were 12 months ago. ANZ forecasts a growth of 1.8 % this year, which will pick up to 3.6% in 2019. The economists see the strong labour market and rising incomes as the main drivers of price growth, with the absence of an interest rate increase this year also supporting house prices. However, Morgan Stanley analysts aren’t as confident, seeing risks building in 2018 after several months of house price weakness and a potential for increased regulatory pressure. “Conditions for housing for the remainder of 2018 continue to look challenging with further regulatory tightening of credit, an increasing stock of properties to be settled, and continued uncertainty on government policy for housing as the election cycle looms,” equity strategists led by Daniel Blake wrote to clients this week. AMP chief economist and head of investment strategy Shane Oliver said that a looming house price crash was unlikely. 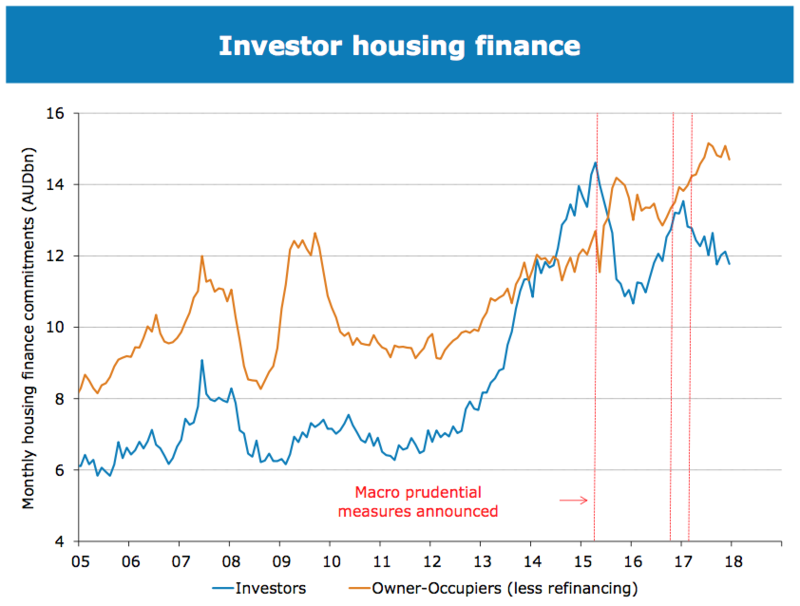 Debt serviceability remains relatively strong, with APRA’s rule tightening leading to a drop in interest-only lending, and mortgage stress appears to be low, for now. “To see a property crash we probably need much higher interest rates or unemployment (neither of which are expected) or a continuation of recent high construction for several years (which is unlikely as approvals have cooled from their 2016 highs),” Dr Oliver wrote. ANZ predicts that Melbourne and Hobart will continue to outperform the rest of the Australian capital cities, like Sydney and Perth. We discussed extensively the growth of Melbourne and the emergence of Hobart in our 2018 outlook on the Australian housing market. Tighter regulations governing the number of investor and interest-only lending has seen a significant pullback in buying activity from those types of buyers, ANZ research shows. Last year, the Australian Prudential Regulation Authority (APRA) changed the rules for lending to investors and interest-only borrowers. There has been an increase in interest rates for these types of borrowers, and serviceability calculations and loan-to-value (LTV) ratio requirements have also been affected. 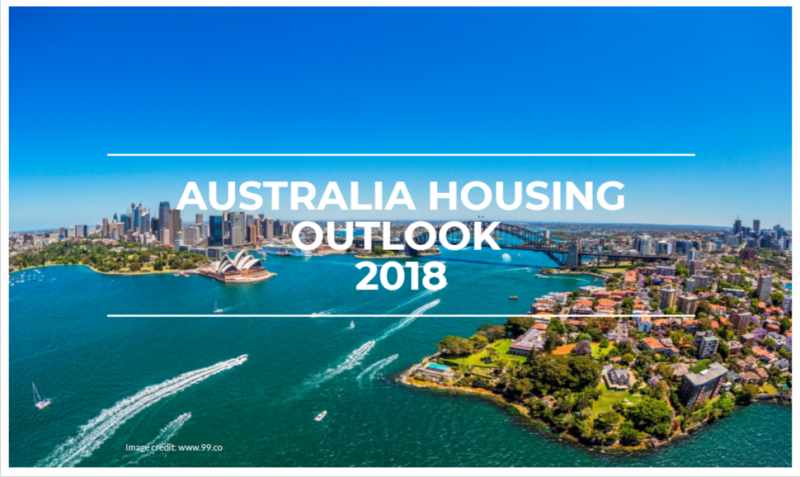 We are optimistic that while tightened regulations continue to moderate investor sentiment, it will not be at too substantial an extent, given that the Australian housing market is underpinned by strong population growth and housing demand. However, despite APRA changes reducing the number of investors in the housing market, to a large extent, the gap is being filled by first-home buyers. 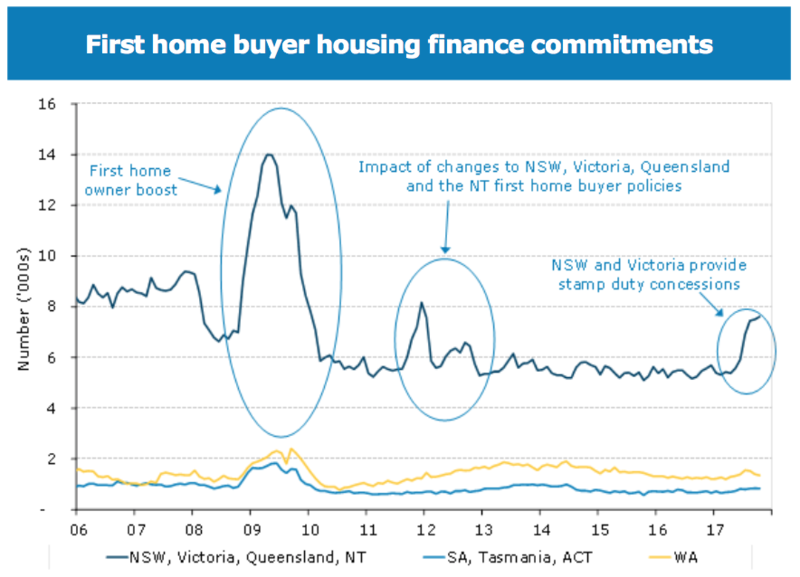 Government grants and sizeable stamp duty tax concessions in NSW and Victoria have helped spur a revival among first-home buyers. The ANZ economists write that high household debt leaves households sensitive to interest rate increases, but this is unlikely to become an issue this year. They predict that the rate hike will come in mid-2019. While Morgan Stanley remains cautious on the property market, the analysts concede consumer confidence has remained above trend, and building activity has also outstripped expectations. “These factors are holding up better than past relationships with prices would suggest, which in turn sees the broader impact of the slowdown in housing prices being limited – so far,” the equity analysts wrote. Australia is ranked within the top 10 happiest countries in the world, holds the number 6 spot for the happiness of foreign-born migrants and is the seventh most accepting country of migrants. Australia is a good place to settle for both natives and immigrants alike. And why not? The country has a sound economy and banking sector, good governance and some of the best education systems in the world. It is home to not one, but three, of the World’s Most Liveable Cities. How happy are you in your own country? More specifically, if you now permanently reside in a country that is not your own, how happy are you living where you are now? Well, if you live in Australia, chances are that you’re a happy camper! A recent study revealed that Australians — both its native citizens and migrants — are among the world’s happiest people. 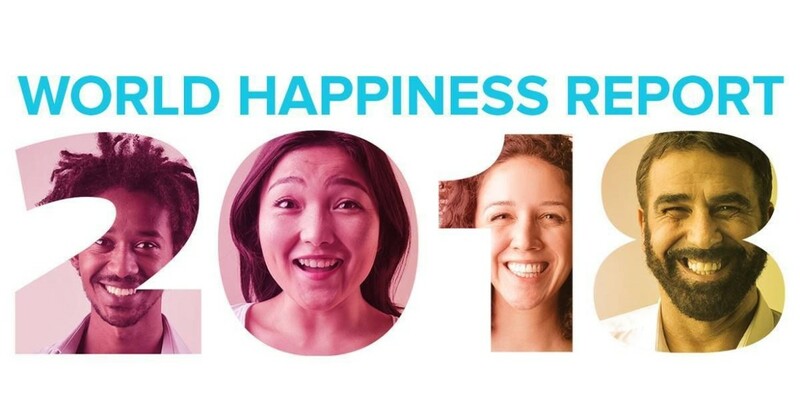 The World Happiness Report 2018, which takes a deep look at how immigration affects the happiness of societies, ranks Australia as the top 10 happiest countries in the world. The report, also ranks Australia as number 6 for the happiness of foreign-born migrants and the seventh most accepting country of migrants in the world. This is especially interesting, given that most of the world’s happiest countries have a high proportion of migrants. In Australia, half the population were either born overseas or has one or both parents born overseas. Clearly, Australia is a good place to settle for both natives and immigrants alike. And why not? The country has a sound economy and banking sector, good governance and is one of the best education systems in the world. 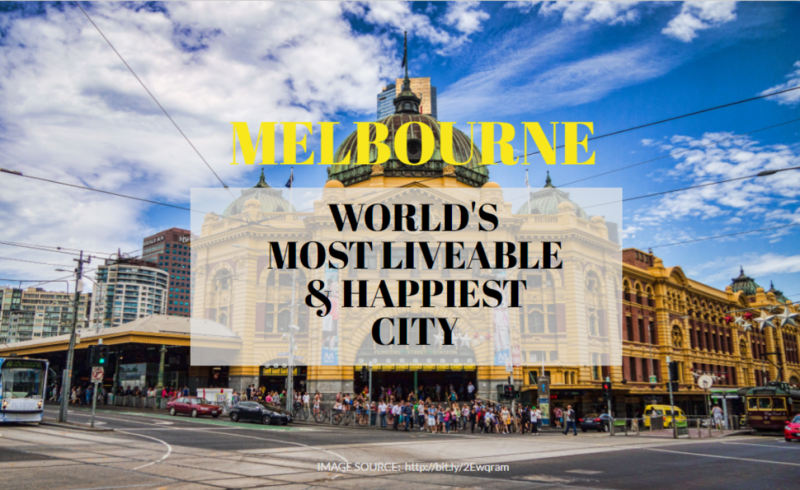 It is home to not one, but three, of the World’s Most Liveable Cities, with Melbourne holding the record of the most liveable city for 7 consecutive years! Little wonder that Australia’s population growth has been on an uptrend, increasing by another 1.6% to 24.7m in the 12 months to end Sept 2017. That’s one person added every 1 minute and 26 seconds! As expected, the state of Victoria experienced the highest growth in the country, charting a rate of 2.4%. 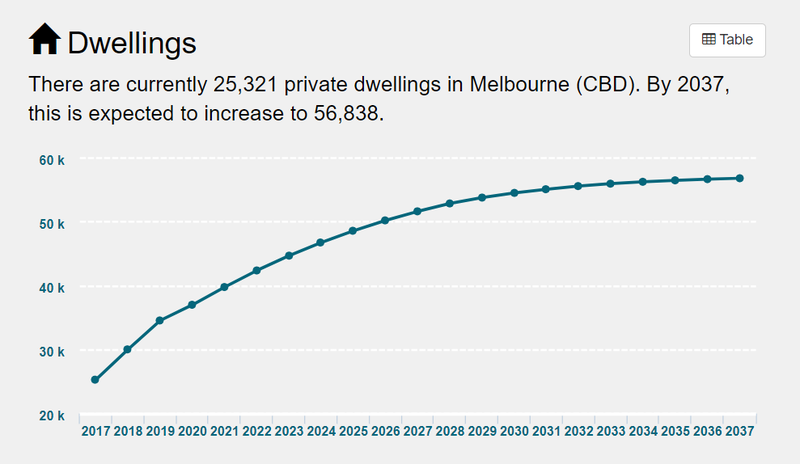 A recent article on the spiraling growth of Melbourne CBD illustrates the population expansion of the city in detail, and how the city is expected to hit 266,455 residents by 2037 due, largely, to births and immigration, thus driving demand for homes. But, back to the subject of happiness. The World Happiness Report 2018 says that a factor determining immigrants’ happiness is how accepting the people of the host country are. It also notes that among the 10 happiest countries of the world, Australia has the highest percentage of migrants at 28% of its population. Perhaps Australia is the most successful multicultural society in the world after all. Spread the happiness around. Let us know how happy you are wherever you are in the comment box below! As the country gears up for the general election, questions abound on its impact on the housing market. What’s the post-election outlook for the Malaysian property market? Bank Negara had announced in November 2017 that the property glut in Malaysia reached its highest level recorded in the past 10 years. At the same time, Deputy Finance Minister Lee Chee Leong announced that the amount of unsold residential units had risen by 40% during the first half of 2017. 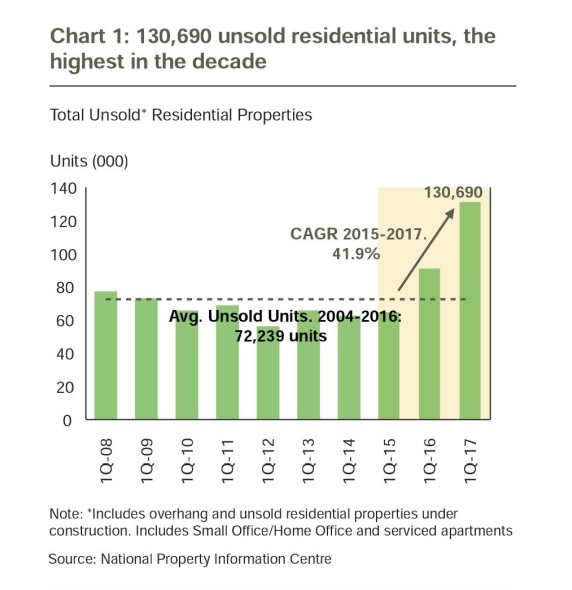 During Q1 2017, unsold residential units climbed to 130,690, the highest in the decade. Over the past few years, the trend in new housing supply has been skewed towards the higher-end property segment. Developers favour the higher-end property segment due to the higher margins it is able to generate, and tend to neglect affordable housing, with it not being as profitable. Thus, right now, the Malaysian property market is characterised by an oversupply of non-affordable housing. Houses remain out of reach for many households due to the failure of the market to produce a sufficient quantity of affordable housing for the masses. The maximum affordable house price in Malaysia is estimated by Bank Negara to be RM282,000. However, in 2016 the actual median house price was RM313,000, beyond the means of many households. From 2007 to 2016, house prices grew by 9.8%, while household income only increased by 8.3%. Bank Negara reports that out of the almost 150,000 unsold properties (146,497) nationwide in 2017, 83% were priced above RM250,000. 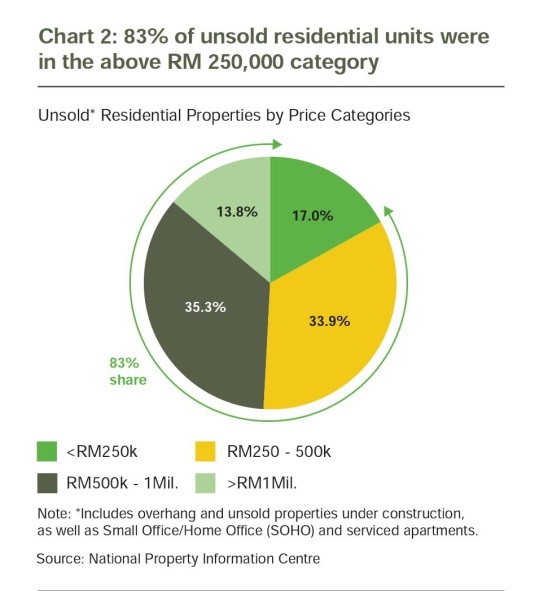 61% of the total unsold units were high-rise properties, 89% of which were priced above RM250,000. By state, Johor had the largest share of unsold residential units, having more than a quarter of the total units (27%), followed by Selangor (21%), Kuala Lumpur (14%) and Penang (8%). 83% of unsold units in Malaysia in 2017 were above RM 250,000. Bank Negara governor Tan Sri Muhammad Ibrahim said the government’s efforts in affordable housing are very much needed, and cites the failure of the property market to provide supply in the affordable range. “If you look at the numbers in 2014 and 2015, the numbers of affordable houses were quite good, accounting for 75% of the supply of residential properties. But in 2016 and 2017, the numbers were reversed, as only 25% of residential properties were in the affordable range. “Obviously, there was a market failure. If the government did not come in and provide the additional supply of affordable houses, the problem would have been acute,” he said after releasing Bank Negara Malaysia’s 2017 annual report and the Financial Stability and Payment Systems Report 2017. The Government had, in November, frozen approvals of luxury property developments indefinitely and temporarily halted the development of shopping malls, commercial complexes and condominiums priced above RM1mil to address the oversupply; it is quite clear that the market is on a decline. Works Minister Datuk Fadillah Yusof has since clarified that this freeze would be applied on a case-by-case basis. There has been much concern that the Malaysian property market is in a bubble. Fears are that the current glut together with the increasing supply pipeline of properties still in construction, will lead to a market crash soon. Real estate expert Ernest Cheong warned that developers were aggressively marketing their properties because they were in danger of losing their bridging finance from banks. The bridging finance is used by developers to support their construction. “This is where the danger starts. I predict if this continues, markets will crash within 24 to 30 months because consumers do not have the financial capacity to buy properties any more. Furthermore, developers who started building two years ago are expected to flood the market further with their units.” he said. IQI Global chief economist, Shan Saeed opined that the property market in the country is merely undergoing some ‘sector changes’, and that there was no danger of a bubble. “In some areas, property prices are going up, but there are also areas where the price is going down. The property market moves with GDP (gross domestic product) growth, and the growth is currently very solid and on the upsurge. Customers are still buying (property) because income levels are rising. So I believe these concerns concerning the property market are unfounded,” he said. Real estate firm Rahim & Co stated that Malaysia is unlikely to face a property bubble with the several pre-emptive measures Bank Negara has already put in to stabilise the market, some of which include abolishing the Developers Benefits Under Liquidity Scheme (DIBS), and tightening of the conditions for financing. CBRE WTW managing director Foo Gee Jen cites the country’s strong fundamentals and measures by Bank Negara as having moderated the impact from price growth in the last market boom. “While housing prices in Malaysia have been on the rise, they have not reached an unjustifiable level where the price unreasonably exceeds its economic returns” he says. Credit rating agency Moody’s expects a decline in property prices due to the supply overhang. “In our view, the increasing oversupply and the prospects of a material property price correction will continue to build as new supply enters the market and poses a risk to Malaysian banks’ asset quality,” it said. Savills Malaysia managing director, Datuk Paul Khong said that house buyers are currently adopting a wait-and-see attitude against subdued and lacklustre transaction activities in the property market. 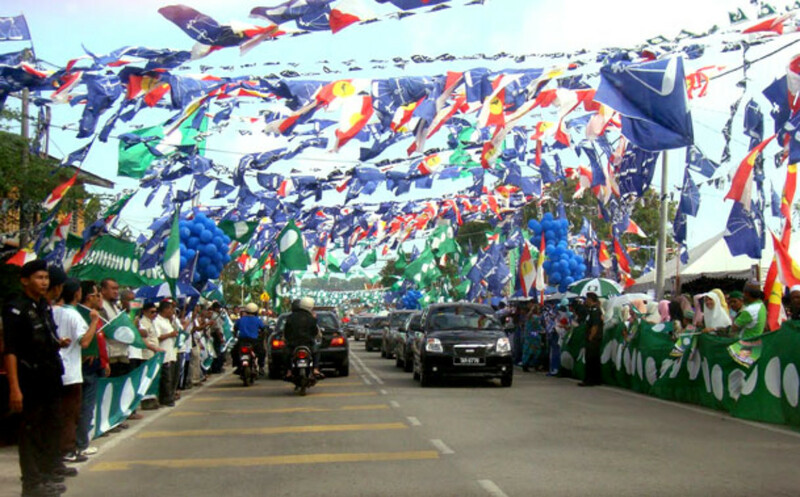 “We do, however, expect some market movements in the later second half of 2018 (2H18) — especially if the GE14 goes well and the confidence factor returns,” he said. Virata Thaivasigamony of property consultancy CSI Prop states that the upcoming General Elections is expected to give a boosting momentum and direction for the country’s property sector. “The ringgit has strengthened so now would be a ideal time to invest in foreign property, in markets like the UK and Australia, with a potential for great returns,” he added, highlighting recent news reports that the ringgit had strengthened to a 2-year high this month. Uncertainty still clouds the local market going into 2018, and the current glut of property, with more still in the pipeline, does not bode well for investment prospects in Malaysia at this time. With the ringgit currently at a 2-year high, property in overseas markets like the UK and Australia are more attractive than ever, offering investors an opportunity to take advantage of the currency rate and get on to the overseas investment bandwagon. 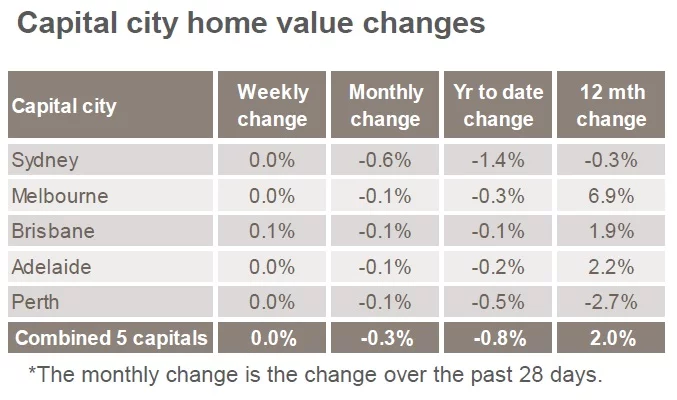 House prices across Australia have stabilized during the past week after months of falling. House prices across Australia seem to have stabilized after months of falling, with prices in Melbourne and Sydney remaining relatively unchanged this week. For the last month, prices in Melbourne dropped by 0.1% and Sydney, by 0.6%. Nationally, housing values have fallen 0.8% since September 2016. On a yearly basis, price growth in Melbourne remains strong at an increase of 6.9%, but muted from the previous year. Sydney, however, registered a decrease of 0.3%. CoreLogic’s head of research Tim Lawless said this was fuelled by tighter credit policies particularly focused on investment and interest-only lending, which reduced demand from that part of the market. “We think there is already evidence that the slowdown in house prices is stabilising,” said David Plank, Head of Australian Economics at ANZ Bank. Could this week’s price stabilization indicate a turning point for the housing market? According to data released by the Australian Bureau of Statistics (ABS) last June, Australia’s residential population soared by 389,100, or 1.6%, to more than 24 million persons in the year to March, the fastest increase since 2014. However there was a 3.3% decline in residential construction, with the last quarter of 2017 recording a 0.7% decline. New-build apartments like the upcoming Palladium Tower in Southbank, are being constructed to address the severe lack of housing in Melbourne. Palladium Tower is strategically located in the Melbourne CBD area, right next to Fishermans Bend, Australia’s largest urban renewal project covering 485 hectares in the heart of Melbourne. By 2050, the area is expected to provide housing for up to 80,000 people, and employment for 40,000. AMP Capital’s Shane Oliver told The New Daily that while Australia was near equality in construction versus population growth, for the most part, yet the last decade of construction had failed to keep up with Australia’s record population growth. Last year, the Urban Development Institute of Australia warned that Victoria could have a shortfall of 50,000 houses by 2020. ABS figures released in June show the state gained 144,400 to 6.3 million persons, a 2.3% increase compared to the previous year at 2.1%. All the signs point to increased demand in the face of short supply over the next few years, especially in places like Melbourne where yearly price and rental rises have been consistent. With construction of new housing unable to match demand for the foreseeable future, opportunities continue to abound for the investor. CSI Prop proudly promotes international investment property with high yields at low risk. Our portfolio comprises residential and commercial property including student accommodation and carehomes, in cities across the United Kingdom (London, Luton, Manchester, Liverpool, Newcastle, York, Glasgow, Scotland; Sheffield, etc) and Australia (Melbourne, Perth, Brisbane). Our projects are concentrated in high-growth areas with great educational, infrastructural and job growth potentials. We aspire to make a difference in the lives of our clients by helping them achieve their investment goals through strong market research backed by third party experts and due diligence. Experts are predicting that Melbourne is heading for a housing undersupply due to the increase in population. Just this week, data released from the Australian Bureau of Statistics (ABS) illuminated the dire undersupply of housing currently besetting the nation. New figures show an unsettling lack of houses, especially where they are needed most — cities such as Melbourne (specifically Melbourne CBD), Sydney, Brisbane and Hobart, all home to impressive population growth rates, are expected to depend greatly on new residential constructions to meet high demand. The ABS figures showed a 3.3 per cent decline in residential construction in trend terms, with the last quarter of 2017 recording a 0.7 per cent decline — such trends still occur despite population growth, immigration and interstate migration which continue to push Melbourne, Sydney, Brisbane and Hobart well into a more populous future! AMP Capital’s Shane Oliver told The New Daily said that, for the most part, Australia was near equality in construction versus population growth, but that the last decade of construction had failed to keep up with Australia’s record population growth. 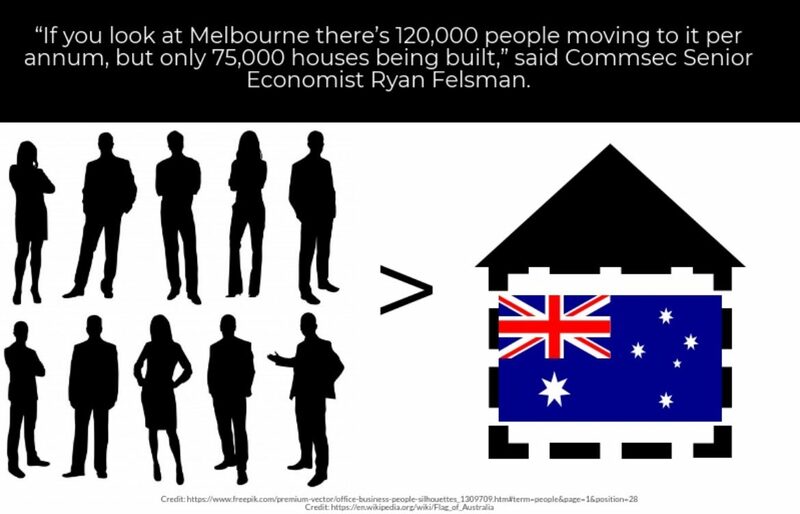 “If you look at Melbourne there’s 120,000 people moving to it per annum, but only 75,000 houses being built,” said Commsec Senior Economist Ryan Felsman, echoing Oliver’s observation. The same concerns about Melbourne, specifically Melbourne CBD, have been heard before, the Urban Development Institute of Australia warned last year that the city could have a shortfall of 50,000 houses by 2020. New-build apartments like the upcoming Palladium Tower in Southbank, are being constructed to address the severe lack of housing in Melbourne. Palladium Tower is strategically located in the Melbourne CBD area, right next to Fishermans Bend, Australia’s largest urban renewal project covering 485 hectares in the heart of Melbourne. By 2050, the area is expected to provide housing for up to 80,000 people, and employment for 40,000. And yet, experts from BIS Oxford Economics who had gone on record to reverse its initial predictions about the surplus of apartments in the city centre, are stating that Melbourne is headed for an undersupply based on the increase in population. If we zoom in on Melbourne’s astounding population growth, the shortage of houses will begin to hold even more weight. As of 2016, the estimated residential population in the municipality of the City of Melbourne was 151,176. This figure, when added to the colossal 903,000 people who were recorded to have travelled to or be present in the municipality on an average weekday, produces a whopping 7-digit figure the housing market is not currently prepared for. Even more surprising is the population growth in Melbourne CBD. The district, which spans only 6.2 km^2, is expected to have a population of 76,982 in 2037, 44% higher than the population in 2017 — this growth forms 29% of the total projected population growth of the City of Melbourne within the same time frame! To illustrate the critical undersupply in Melbourne, is a recent story of regarding a property developer, Tim Gurner, whose launch of rental apartments at 74 Eastern Road , South Melbourne, amassed a queue of people who snaked around the block to inspect the 47 newly completed units. The Australian Financial Review Rich Lister said his 74 Eastern Road apartment development attracted more than 500 inquiries and 150 rental applications without a single advertisement. All the apartments were subsequently leased within a few hours. “We have been absolutely blown away by the response to the first inspection, which we only advertised with a single sign board on the front facade. Half an hour before the inspection time we already had a line out the door and around the corner,” Mr Gurner told The Australian Financial Review. Gurner closes his account by declaring that operations that further restrict housing supply, such as increasing taxes on new constructions, will only exacerbate the issue for the house-hunting population. As expected, high demand for houses will continue to propel Australia’s property market forward. Melbourne, especially, Melbourne CBD, is expected to take the brunt of this undersupply following its high population growth rate. The University of Melbourne is building a new campus in Fishermans Bend as part of an ambitious A$1 billion plan to create a world-class engineering school in Victoria. The university’s 2025 Engineering Strategy plan also includes upgrading the engineering facilities at its main Parkville campus site and developing the former Royal Women’s Hospital site. The plan is expected to provide an A$8 billion boost to Victoria’s economy and generate over 15,000 new jobs by 2035. The new campus — the institution’s eighth, to date — is located within Australia’s largest urban renewal project, right in the heart of Melbourne. Construction begins this year and it is expected to be ready in the early 2020s. Vice-Chancellor Professor Glyn Davis said: “The university will be a catalyst for new collaborations and investments, connecting industry and research in the precinct. “We have a proud history of innovation in this country. The new campus will give our researchers and students opportunities to work alongside industry, and pursue rich careers right here in Australia. “When surrounded by start-up accelerators, business incubators, cutting-edge research, development and manufacturing facilities, and test sites, our students can immediately put ideas into action,” he said. 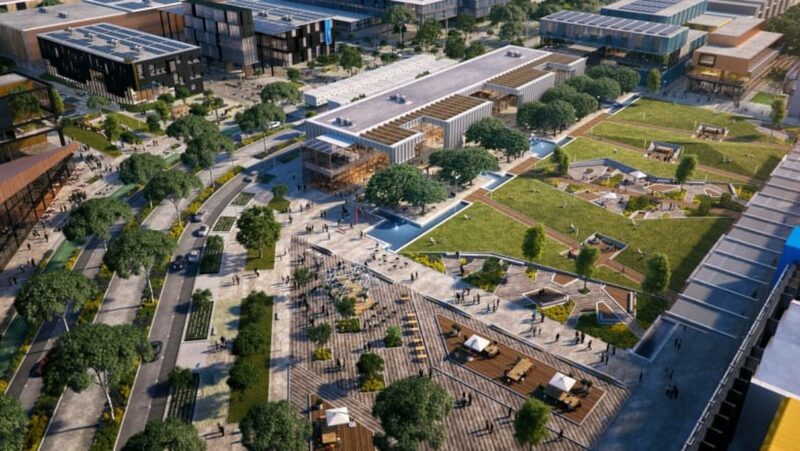 The move to Fishermans Bend will expand the University of Melbourne’s capabilities to undertake large-scale research and innovation, such as autonomous vehicles and smart grid technologies, with the inclusion of on-site facilities such as wind and water tunnels. University of Melbourne School of Engineering Dean, Professor Iven Mareels said that the new campus would help to create entrepreneurial leaders and transformative technologies of the future. “The Fishermans Bend campus will initially enable 1,000 engineering and IT students and academics to collaborate with world-leading local and international companies across industrial sectors as diverse as transport, energy, food, mining, infrastructure and water,” he said. Fishermans Bend is Australia’s largest urban renewal project covering 485 hectares in the heart of Melbourne. It will consist of five precincts across two municipalities – the City of Melbourne and the City of Port Phillip – and connect Melbourne’s CBD to the bay. By 2050, the area is expected to provide housing for up to 80,000 people, and employment for 40,000. The population growth rate of Melbourne has increased to 2.4%, which means 110,000 people are moving to the city every year. Vacancy rates in Melbourne continue to fall due to the severe undersupply of housing. New-build apartments like the upcoming Palladium Tower in Southbank, are being constructed to address the lack of housing, which is less than 5km away from the new campus, and can be reached by bike in less than 20 mins! Nearer still, and just 5 mins away by bike from Palladium Tower is the University of Melbourne’s Southbank campus, which is also undergoing a A$200 million transformation. This transformation, expected to be ready by 2020, will see the Conservatorium staff and students co-located with their colleagues and peers at the Victorian College of the Arts at the heart of the Melbourne Arts Precinct. Palladium Tower has a walk score of a near perfect 98/100, which reflects how easy it is to get around without a car. With a self-contained Woolworths supermarket, and the Crown Casino & Entertainment Complex, Melbourne Convention & Exhibition Centre, Melbourne Arts Precinct and the Royal Botanical Gardens all within walking distance, Palladium Tower is strategically located at the nexus of all the city has to offer. Keen to find out more about Palladium Tower or other projects in Melbourne? Give us a call at 03-2162 2260 or 016-221 8691/9150. Feel free to share and comment on this article! In Melbourne, house vacancy rates become tighter even as property flies off the market at amazing pace — a clear indication that the city’s property market is undersupplied. Melbourne property is the fastest selling in Australia. Melbourne property is currently the fastest selling amongst Australian cities, at an average period of 33 days. The city tied with Hobart at the top spot, according to a CoreLogic Property Pulse report. The report revealed that properties sold privately in Australia last year took an average of 45 days to change hands. 40 days was the average for properties in the capital cities. The average time taken to sell a property was 41 days in Adelaide, 42 in both Sydney and Canberra, 47 in Brisbane, 53 in Perth and 75 in Darwin. CoreLogic state director for Victoria, Geoff White said that strong buyer demand was keeping Melbourne’s average days on market low, with properties in popular parts of the city commonly selling within a week. He also said that the days to market would remain low for the foreseeable future. Carrie Law, the chief executive of leading Chinese property website Juwai.com said that this may be the biggest week of the year for Chinese property buying in Melbourne. A recent survey done by the portal shows that Australia is the second favourite offshore investment destination for Chinese buyers, behind the US. Realestate.com.au chief economist Nerida Conisbee said suburbs around Melbourne’s top universities continues to draw strong interest. Even as houses fly off the market, rental prices are rising in Melbourne due to the low vacancy rates. Figures from SQM Research show just 1.8% (9744 properties) of property in the city was available for rent, down from 2.1% (11,478) in December. SQM director Louis Christopher said this shows that the dire warnings of apartment oversupply have not eventuated. On the contrary, it looks like there is a housing undersupply in Melbourne. “What’s happened here is the population growth rate is a lot faster than the Australian Bureau of Statistics expected and that’s absorbed the additional stock in the market,” he said, adding that vacancy rates in the Southbank market fell to 3.9% from 6% in January 2017 and Docklands is at 2.8%. A population growth rate of 2.4% indicates 110,000 people are moving to Melbourne every year. The vacancy rates continue to fall due to the severe undersupply of housing. Melbourne’s price growth has lowered from the rapid rises seen previously, which will further increase rental take-up and sales. Yet, the city’s price growth continues to outpace all other mainland state capitals, at 7.3%. Housing is a necessity in Melbourne. As the population continues to swell, so must housing supply. 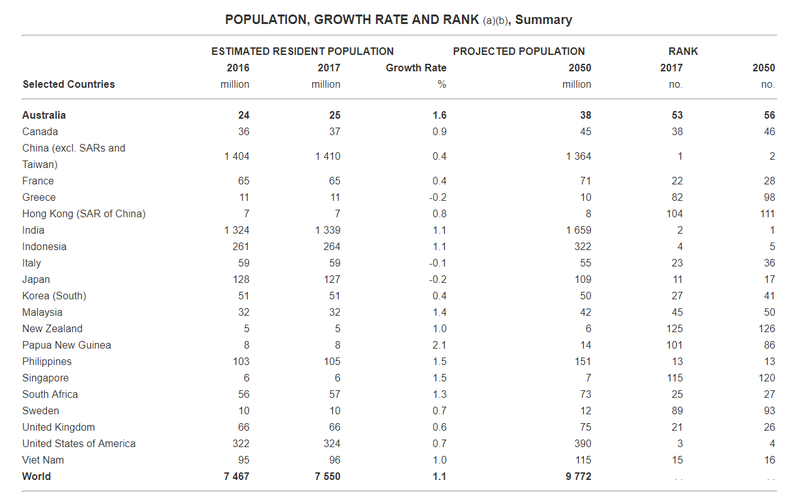 Perhaps the easiest measure of how deserving Melbourne is of the World’s Most Liveable City title for the 7th consecutive year, is its increasing population growth. That, and the fact that it is perhaps the most populated state capital city in Australia, with 75% of the population of the entire state of Victoria living in Melbourne city alone. In 2016, the Australian Bureau of Statistics (ABS) reported Melbourne as having the most epic population growth of any Australian city, making up almost a third of Australia’s population growth. The contrast is quite significant, with 2.4% in Melbourne compared to 1.2% in the rest of Australia. In ABS’ latest report, Melbourne (Victoria) continues to headline the country’s population growth of 388,100 people, with an increase of 2.3% year-on-year. But first, a short lesson in geography: Melbourne, with its population of approximately 4.8 million people, comprises the broader metropolitan area (also known as Greater Melbourne) as well as the city centre. Altogether, it consists of 31 municipalities. 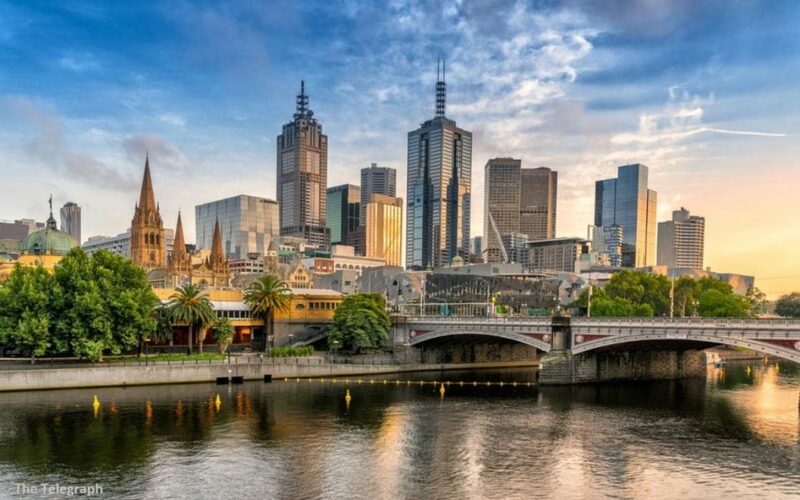 However, this article specifically refers to the city of Melbourne which encompasses the Melbourne CBD, Southbank, Docklands and many of the suburbs in Melbourne’s inner city. As of 2016, the estimated residential population in the municipality of the City of Melbourne was 151,176. A whopping approximate of 903,000 people people were recorded as having travelled to, or were present in the municipality on an average weekday in that same year, an increase of 6% from 2014. 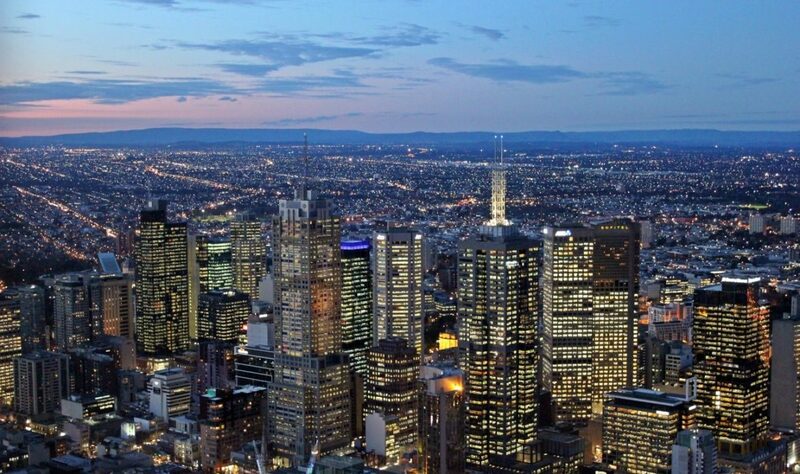 Statistics in the City of Melbourne’s Daily Population Estimates and Forecasts reveal that expansion in the city will continue, and is expected to hit 266,455 residents by 2037 due, largely, to births and immigration. According to projection estimates, there will be over 1 million people in the city on an average weekday within the next 5 years, and 1.4 million by 2036. Recently, BIS Oxford Economics predicted that Melbourne is headed for an undersupply in housing. What makes this especially noteworthy is the fact that it was a complete reversal of its earlier prediction that the city would suffer a surplus of apartments! The consultancy has based its forecast on census figures that show Melbourne had 109,000 more people than previously expected. “We thought it would get to a 20,000 excess (of apartments) in Victoria by 2018. We’re now saying in 2018, the market has still got an undersupply of about 2000 dwellings. We’re talking a 20,000 turnaround,” said BIS managing director Robert Mellor. Figures by the ABS show that between 1991 and 2016, the population living within 10km of the CBD grew by 40%, from 743,000 to 1,042,000. Melbourne’s CBD has also seen spectacular growth; with its population swelling from 1611 in 1911 to 15,249 in 2006 and 35,447 in 2016. The increase in population is reflected by a sharply-tightened vacancy rate of 1.7% and 1.4% for apartment units and houses at as recent as Q3 2017. According to Mellor, census figures show that the proportion of students rose to 27% demand for inner city apartments in 2016, from 20% in 2011. Students comprise a key demographic occupying apartments in the CBD, where Melbourne’s high-rise supply has been concentrated. According to SQM managing director Louis Christopher, the last time the figure slipped as low as 1.7% was in June 2007. “This is quite remarkable — despite predictions of looming apartment oversupply in inner-city Melbourne, we are seeing vacancies fall rather than rise,” he said. 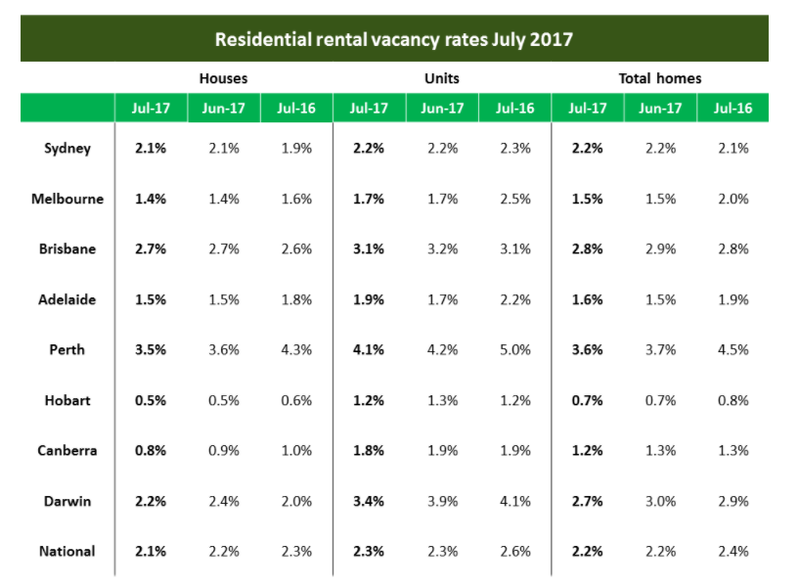 The tight vacancy rate is good news for landlords, especially if seen from the perspective of future population growth. By 2037, the CBD’s population is expected to reach 76,982, 44% higher than the population in 2017. 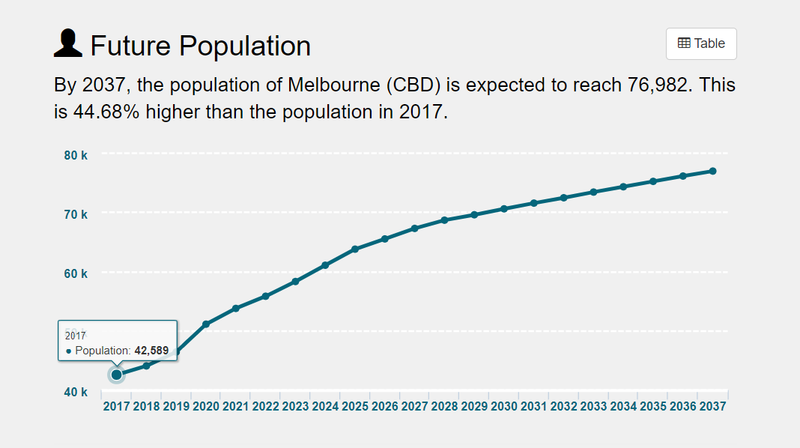 Interestingly, this growth forms 29% of the total projected population growth of the City of Melbourne within the same time frame — a significant percentage, particularly if you consider that the CBD spans an area of about only 6.2km2! 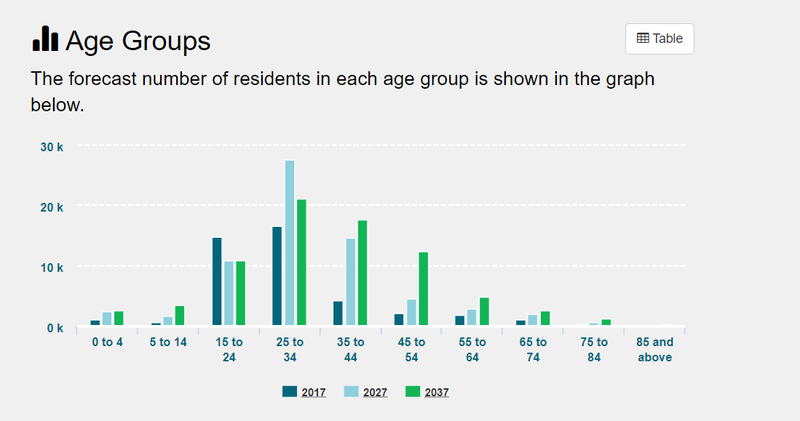 In terms of age, the CBD population will be dominated by the 25- to 34-year-olds, followed by the 35- to 44-year-olds by 2037. Logically and based on current property prices, the 25- to 34-year-olds represent the demographic that is most likely to rent a property. Meanwhile, housing looks set to increase too, with the number of private dwellings projected to grow to 56,838 in 2037, compared to 25,321 dwellings in 2017. Back in the day, the CBD was probably last on a laundry list of choice residential areas, but this trend is changing. While the CBD may not be the cheapest area to live in Melbourne, there is a growing community of residents. What will continue to draw the crowd and keep the CBD alive, are its industries and jobs, and its proximity to universities, festivals and the arts, food and beverage, services and retail. It has been said that housing is, by far, one of Australia’s largest assets and the foundation of its household wealth, financial system and economy. Little wonder, that: as of Dec 2017, the total value of the nation’s 10 million residential dwellings stands at $6.8 trillion according to latest official estimates by the Australian Bureau of Statistics (ABS). Over the last 5 years, house prices in Sydney and Melbourne — two of Australia’s biggest property markets — had increased 75% and 59%, respectively. 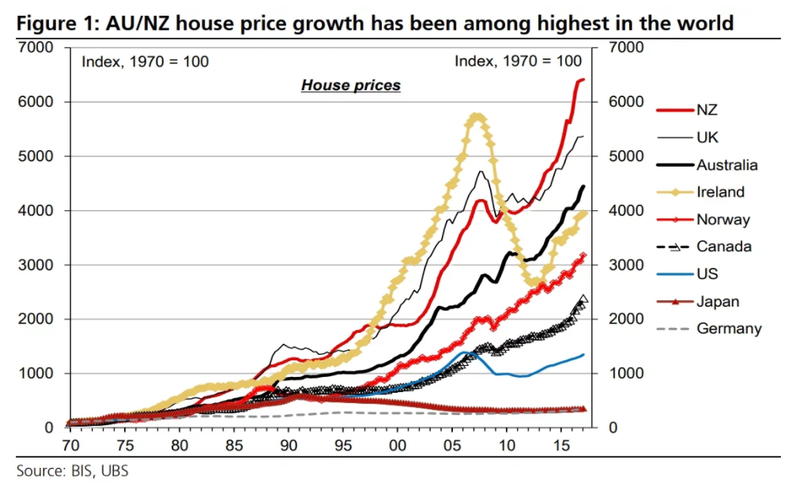 Just 3 months ago (Oct 2017), a report by the Swiss-based Bank of International Settlements (BIS) pegged Australia as having the 6th highest rise in annual property prices in the world over the last 5 decades, with house prices surging 6556% since the 1960s at an average increase of 8.1% per year. Be that as it may, Australia’s housing market saw substantial moderation in 2017 (particularly the second half) led largely by Sydney, and, to a lesser extent, Melbourne, due to stricter lending measures which have affected investor appetite. What, then, would the outlook be like in 2018? The property market will continue to see growth in 2018, albeit at fairly modest levels as tightened regulatory and lending criteria for investors remain in place. 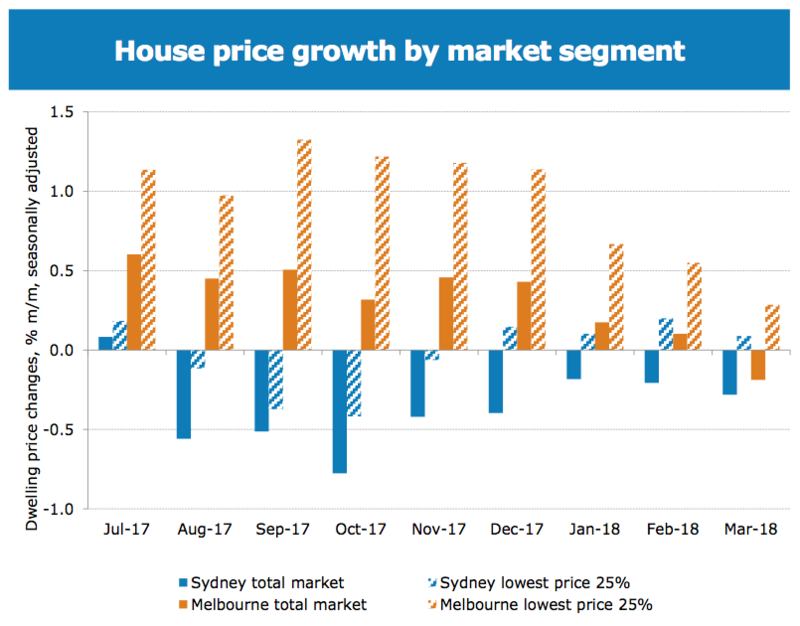 The moderation of house values across Australia will be driven by Sydney, which had already begun experiencing a drop in price levels in Nov 2017. Yes, it does appear that the Sydney boom is over, but while we agree with the common perception that prices in Sydney may fall in 2018, we don’t think the prices will drop drastically within the year. In Melbourne, price growth will also ease though not at Sydney’s rates, given that property is more affordable. Speculators are pulling back but serious investors know that the city is backed by strong population growth. Again, in both cities, we don’t see anything that suggests widespread declines in prices. Perth will be a city to watch as we think the housing market has finally reached its bottom. Market experts predict that Perth property prices will be flat in 2018, but that interest levels and, consequently, demand will eventually pick up. A recent ANZ-Property Council Survey reveals that confidence levels in Western Australia are rising to similar levels seen in Australia’s eastern states. Experts are also predicting modest growth to continue in Adelaide and Brisbane, slowing at more moderate levels in Canberra. Hobart, Australia’s stand-out performer last year, will continue to have strong growth levels, albeit slower than its double-digit surge in 2017. The value of the property market next year will depend largely on whether the Bank of Australia (RBA) will increase interest rates, or if there will be further tightening on lending criteria. That said, it looks unlikely that interest rates will budge from the 1.5% level that it is at currently. Australia’s housing market has remained vibrant due to active investor activity and strong population growth. The latest Foreign Investment Review Board (FIRB) Annual Report 2015-2016 found that residential real estate applications had increased by 19% to to $72.4bn in 2015-2016 compared to $60.8bn in the previous year. The total number of applications approved for residential real estate had also jumped from 36,841 to 40,149 during this period. It is interesting to note that residential property approvals comprised 96.9% of all foreign investment approvals. 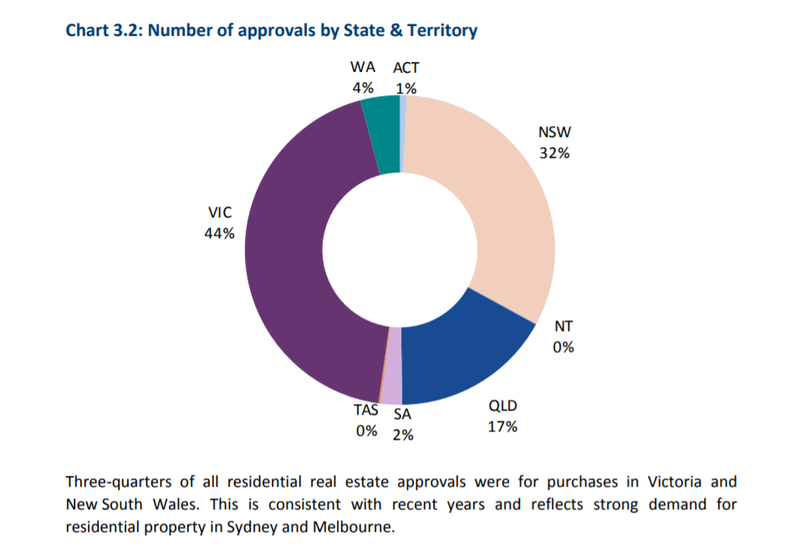 The largest residential approvals were in Victoria (44%), followed by New South Wales (32%), Queensland (17%) and Western Australia (4%). Meanwhile, the top 10 countries that dominate real estate in Australia include China (highest at $31.9m), US, Singapore, Malaysia and Japan. Tightened regulations will continue to moderate investor sentiment, but not too substantially, as the housing market remains underpinned by strong population growth. This will translate to increased demand for housing. 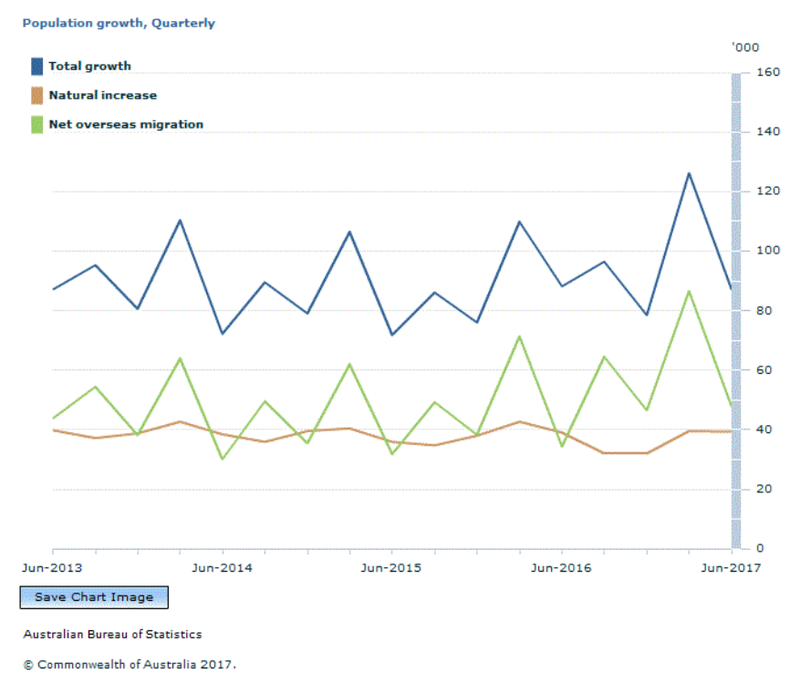 The latest report by the Australian Bureau of Statistics (ABS) shows that Australia’s population grew by 388,100 people with Victoria being the fastest-growing state or territory, with a population increase of 2.3%. Nett overseas migration (NOM) was recorded at 245,400 in 2017 — an increase of 27% from the previous 12 months. New South Wales (NSW) was the most popular destination with NOM of 98,600 followed by Victoria with 86,900, Queensland (31,100) and Western Australia (13,100). 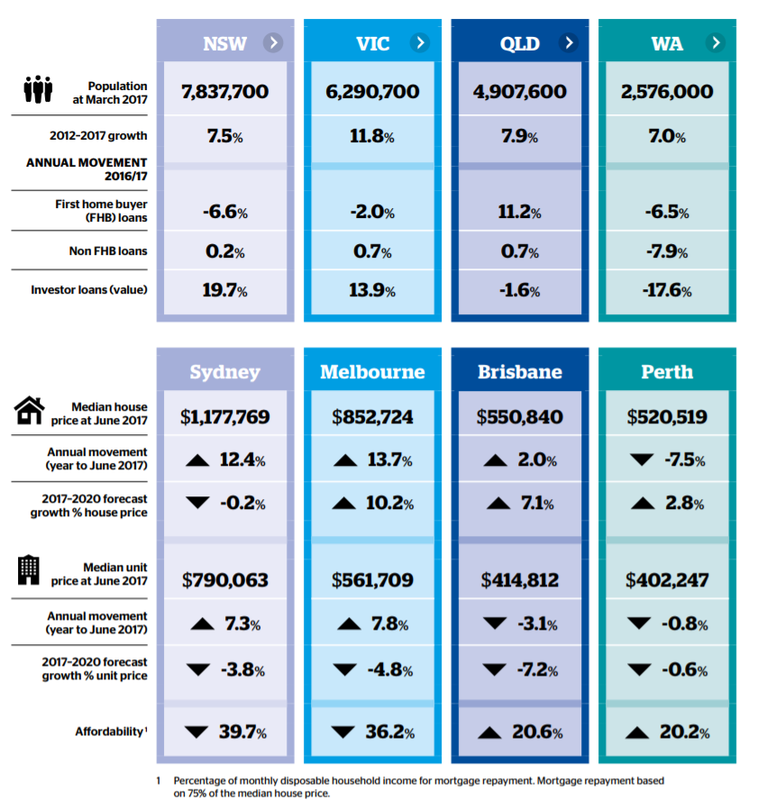 “NOM in NSW and Victoria increased by 31% and 23%, respectively. This growth has seen both states surpass their previous recorded high in 2008-09,” said ABS Demography Director Beidar Cho. Despite the cooling in price growths in the mainstream markets, Australia will continue to attract migrants, says Virata Thaivasigamony of CSI Prop. For whatever it’s worth, the current ANZ-Property Council of Australia Confidence Index (March quarter) came in at 137.7 in their latest survey, just below the all-time high of 139.5 in the final quarter of 2017. That’s a lot of confidence in the market! 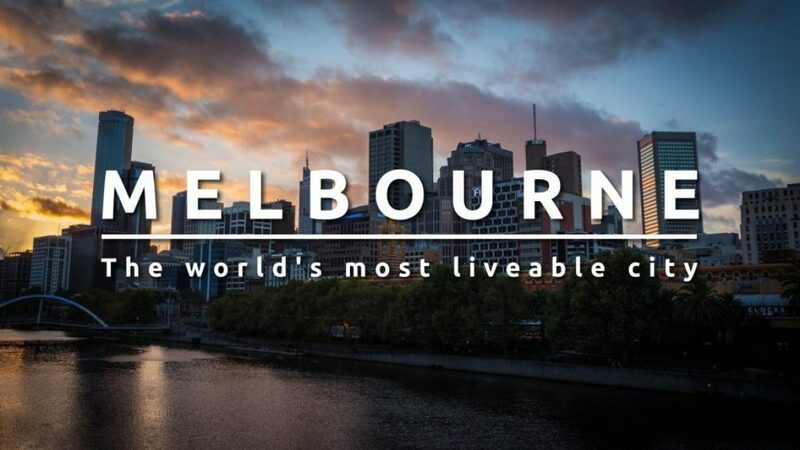 Melbourne is the only country to win World’s Most Liveable City for 7 consecutive years. The Australian city of Melbourne, Victoria has been declared the world’s most liveable city again – for the 7th consecutive time. This is the first time in the survey’s 15-year history that a city has held top spot in The Economist Intelligence Unit’s Global Liveability Index for seven consecutive years. Vancouver, which shared the top-ranked spot with Melbourne from 2002 to 2004, held the title for 6 years. The Economist’s report scores each city out of 100 for stability, healthcare, culture and environment, education and infrastructure. It also looks at factors such as crime, how good the food is and even how bearable the temperature is in each of the 140 cities surveyed. Housing affordability is not considered. Melbourne’s overall rating is 97.5 out of 100. Little wonder that the population of the city has continued to swell dramatically by around 2000 people a week, a quarter of them from Sydney. Melbourne is not the only Australian city listed in the Survey. Adelaide is at 5th place (with Calgary in Canada), Perth at 7th place, Sydney at 11th and Brisbane at 16th. Sydney used to be in the global top 10 and is now overtaken by two smaller Australian cities.